American DJ Hypnotic RGB laser effect DJParts - All Variety of Parts that DJ Needs. 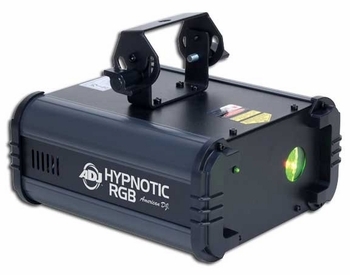 The Hypnotic RGB, from American DJ, projects unique “web type” red, green and blue laser patterns! This laser effect features one 30mW green laser, one 80mW red laser and one 350mW violet blue laser, and is approved by the FDA! The Hypnotic RGB is perfect for small clubs or the entertainer on the go. It's light weight, portable, has wide coverage and is easy-to-use. Just turn it on and let it run in sound active mode through it's built-in laser patterns. Link up to 24 units using 3-pin DMX cable and IEC In/Out power connectors to create an exciting laser show on a dance floor, wall or ceiling with or without the use of fog. The Hypnotic RGB also operates in Master/Slave or DMX modes. It features a digital DMX display for easy navigation. Users can also use the UC3 easy-to-use controller (sold separately). Laser patterns can be projected on a dance floor, ceiling or wall 2 DMX Channels 3 operation modes: DMX, Sound Active & Master Slave Sound active from built-in programs Digital DMX Display with 4-button menu for easy navigation High quality stepper motor for smooth movement Very low power consumption Includes hanging bracket Linkable via 3-pin XLR connectors On/Off button on rear panel Safety hook on rear panel Fan cooled Durable metal housing Beam angle: 78 degrees IEC In & Out to Daisychain Power (Connect up to 24 Hypnotic RGBs) 1/4” input for optional UC3 remote control (sold separately) Multi-voltage: AC 100-240V, 50/60Hz (IEC Plug) Power Consumption: 13W Laser Diodes: 1x 30mW Green + 1x 80mW Red + 1x 350mW Violet Blue Dimensions (LxWxH): 10.5”x9.25”x4.75” / 268x235x121mm Weight: 8 lbs. / 3.4 kg.